The second film to be screened at BIFF was a documentary that proved to be a tough watch. To clarify, it’s not a bad film at all, its just the subject matter is particularly harsh. It was also the first film I’d seen in the Liberty Theater since I left in 89, and I took my girlfriend, Tracey, to see Indiana Jones and the Last Crusade… and my first impression stepping back into the theater… Smaller than I remember. But everything seemed larger than life for me that summer, so, perhaps that’s it. During 1965 and 1966 there were mass killings of ‘communists’ in Indonesia. 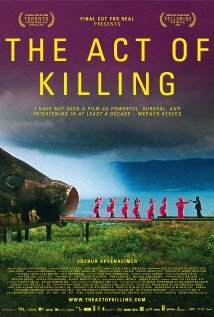 Our filmmaker follows one of these executioners about, Anwar Congo, and his dedicated right hand man, Herman Koto. The two see themselves as movie-theater gangsters, fashioning themselves after Brando, Pacino and John Wayne. For them, and others the word gangster means free men, and that is how they chose to live their lives. By extorting money from shopkeeps (shown on film with unnerving clarity), and happily recalling the lives they erased by taking the filmmakers on a tour of killing grounds and regaling them and the audience with tales of the atrocities they committed with the government’s blessing. They begin to reenact and glorify their actions by making their own film, in the vein of the great Hollywood noirs, westerns and even musicals. Motivating their extras to work naturally, they mostly seem to happily improvise their attacks, leaving men, women and children sobbing wrecks after cut is called. It’s rough and brutal, and the final climax has them torching a village, as if they were more intent on reliving their own glories no matter what the cost. Shots through flames bring the viewer a frightening look at these horrendous events. At the film’s outset Anwar seems frighteningly proud of all the things he did. As a gangster and one of over 3 million members of the Pancasila Youth, he demonstrates the best way to kill people after the smell and mess of all the blood became too much for him. He also quite contentedly shares fashion tips, don’t wear white around blood stick to thicker pants. He also decides to dye his hair black as the film within the film goes on, as he attempts to reclaim what he sees as a glorious youth well-spent. He’s jovial, he laughs as he tells his stories, but at night he’s haunted. Tortured by the eyes of one of his countless victims that he forgot to shut. His fellows seem more at ease with their actions, telling themselves it was war, not some mass murder of anyone they, or their higher-ups in the press or government deemed uwanted. Herman, a rather large gentleman, even decides he would like to run for local office and he and his wife go out to barter and threaten the locals, promising gifts upon election, bribes is the word of the day. Anwar and his fellows wander neighborhoods and memories like untouchables, above it all, dealing out threats, violence and death at a glance. Acting and behaving like thugs turned kings. Frightening. As they continue to make their film, hearing stories from families of those they ruined, and giving one another advice on proper acting, there is a shift. Anwar is the film’s focus and Joshua begins to pursue him almost relentlessly with the camera, showing him in bed, unable to sleep before slipping his happy mask back into place as he socializes. Whether it was Anwar’s idea or Josh’s, in one scene for their film, which Congo believes and touts on national televising that it is one of the greatest, on par with Hollywood fare, Anwar takes on the role of the ‘communist’ being tortured. The Bermuda International Film Festival continues through until Thursday, what are you seeing?